When I poke my head under the roll-up door of Paulson Fontaine Press on a Saturday afternoon in July, the West Berkeley warehouse is teeming with activity. Rhea Fontaine, the press’s Gallery Director, is conducting a video interview with Samuel Levi Jones, whose prints — quilt-like grids made from tattered book covers, salvaged from UC Berkeley’s African-American studies department — hang on the walls around us. Pam Paulson, the press’s co-founder is next door in the studio, wearing a protective mask and surveying a set of psychedelic, richly-textured proofs arranged on the wall. The studio’s work table is littered with basketball nets, some cloth and some chain-link, which Paulson and Berkeley artist David Huffman have been using as raw materials to create the pieces we’re now admiring. In different ways, Huffman and Jones embody a lot of what’s special about Paulson Fontaine. Both use nontraditional, symbolically loaded materials to explore ideas about the Black experience. The prints they’ve created here are the products of extensive experimentation, of playing around and seeing what happens. Their works point to big, complex ideas, but they also feel like they were genuinely fun to make. 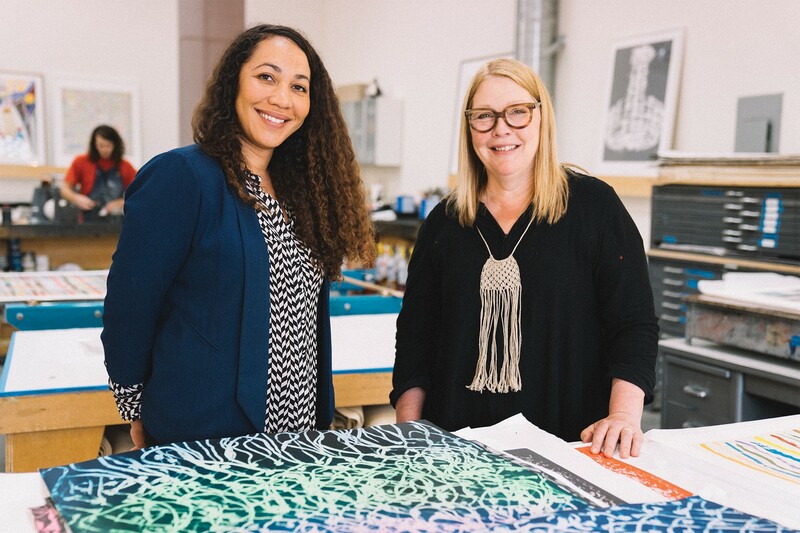 Founded in 1993 by Paulson and former partner Renee Bott, Paulson Fontaine specializes in intaglio printing — a technique where an artist transfers a design by pressing paper to an etched plate that holds ink beneath its surface. The process can be painstaking, but the continuous challenge of finding new ways to funnel an artist’s ethos into two-dimensional space makes for a seemingly boundless experimental potential. “I fell in love with the process of working with an artist, of trying to make their considerations my own,” Paulson said. That agenda has evolved over the years. Paulson, who cut her teeth as at San Francisco’s Crown Point Press — working firsthand with art royalty like Ruscha, Diebenkorn, and John Cage — describes a sort of awakening in 1997, after hearing the painter Kerry James Marshall give a talk about the dearth of Black voices and representation in major museums and art institutions. From those early years on, Paulson and Bott made it a priority to work with not only brilliant artists of color (including Marshall himself eventually), but a wide variety of artists whose voices or sensibilities felt underrepresented in traditional art spaces. Those priorities were particularly appealing to Fontaine, who, then a recent art school grad, joined the team in 2000, after hearing they had worked firsthand with Martin Puryear, the celebrated artist best known for his transcendent, minimal wooden structures. Sixteen years and hundreds of editions later, Paulson Fontaine’s output feels as meaningful as ever. This year, Paulson and Fontaine are in a position to contribute to one particular project that embodies some of the press’s central values on a grand scale. Revelations: Art from the African-American South, running at the de Young Museum in San Francisco until next April, aims to secure a place in the American canon for a variety of idiosyncratic Black artists whose work has historically been neglected, obscured, or relegated to categories like “outsider” or “folk” art. Several artists at the center of the exhibition — like the cosmic found-object sculpture artist Lonnie Holley or the extraordinary Gee’s Bend Quilters — are Paulson Fontaine alums. The same could be said, of course, not just about the artists who occupy the space, but about the two women who cultivate it, too.